You are here: Home-> News & Events->Pool Mosaic Art: Enjoy Swimming With Lovely Dolphin! Pool Mosaic Art: Enjoy Swimming With Lovely Dolphin! There are a great many factors to think if you are going to design a swimming pool. From size, shape, pool building materials to its chemical system and filtration system, your list goes on. Among these considerations, the most fun and final part is to implement the pool art. Pool art makes a decorative effect to your swimming pool, generally at the pool bottom, which make good use of murals, pictures, decals and graphics. There are different types of pool building materials of various taste and styles, while it always make the same effect to create a inspiring swimming pool for everyone to enjoy. Apart from adding color splash to your pool, pool art can also have a 3D effects as the water moves. When you choose pool art mosaic design for ocean creatures, the result of swimming dolphin, turtles, waving corals will make you surprised. Dolphin mosaic design everyone loves it, especially for children. Same as turtles, dolphin pattern is a funny, inviting and clever choice for pool surfacing. Dolphin mosaic tiles will perfectly make your swimming pool a bit more interesting and welcoming. It is good to apply the dolphin mosaic on the center of pool, remember to choose the right pool decking tiles and mosaic grout colors, which is essential to make a more natural look. “Lovely dolphin” at Bluwhale Tile is popular design for individual murals, which will make your swimming pool look lively. Especially, kids will enjoy their swimming in such a fun pool area! 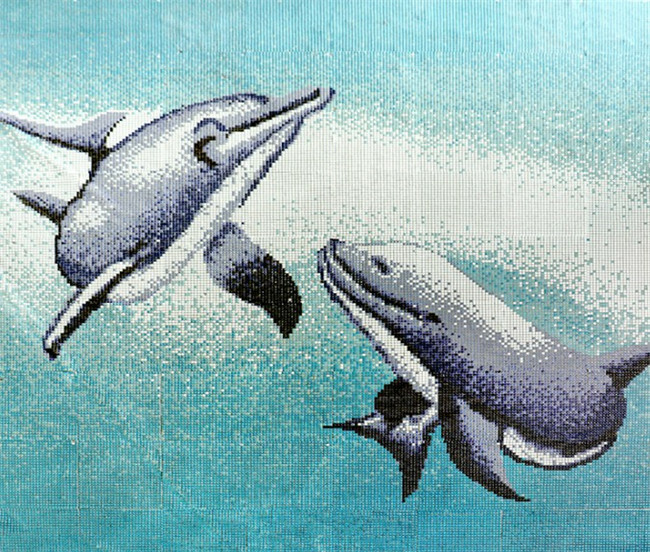 Double dolphin, this customized ceramic mosaics are designed at the latest trend, with chip size at 9.5x9.5mm and 6mm-thinkness. Each ceramic pool mosaic piece is manufactured to bring a high level of appeal. This dolphin series in a more traditional appearance will appeal to most people. Generally, most ceramic mosaic tiles have a relatively high water-absorption rating, so these mosaic tiles are not recommended to be used above the frost line in swimming pools exposed to freezing temperature. Look at another dolphin mosaic design, this pool art mosaic design come with a shadow, which can add another dimension to your pool and create a visual effect of elevating off the bottom of your swimming pool. For more pool arts, welcome to visit our pool art mosaic murals collections, which comes in various options for you. Also, our art mosaic series can be customized in different sized and patterns according to customers’ requirements. No matter which pool mosaic pattern you choose, you will get fun and relax yourself to this attractive swimming pool area.